Tickets Available: Universal Orlando Resort offers 2-Parkand 3-Park Base tickets which are great for the first time visitor that wants to take their time to enjoy one park per day.Choose a 2-Park or 3-Park, Park-to-Park ticket for the flexibility to access Universal Studios, Islands of Adventure and Volcano Bay on the same day. To visit Volcano Bay, you must choose a 3 Park ticket. Where in Orlando can you cast spells with Harry Potter™, meet the mischievous Minions, eat a Krusty Burger in The Simpsons’ home town, and join an intergalactic war featuring the Transformers™? The same place where you’ll race with the Fast & Furious, fight aliens alongside MEN IN BLACK™ and engage in animated antics with Shrek, among other unforgettable adventures: Universal Studios Florida™ at Universal Orlando Resort™! Step inside, and you’ll enter an amazing world of some of Hollywood’s biggest blockbusters, where fantasies become real and you’re always the star — and you’ll only find it in Orlando. If it’s action you crave, you’ll get it at Universal Studios Florida, starting with Fast & Furious — Supercharged. Based on the hit movies, this high-octane ride is the first of many lead roles waiting for you here. For instance, you can help save the world from extraterrestrial invaders in MEN IN BLACK™ Alien Attack™ and TRANSFORMERS™: The Ride — 3D. Or, flip the script by helping a lovable alien phone home in E.T. Adventure. Of course, if you prefer fantasy to science fiction, you’ll want to take a dose of Floo powder and head directly to Diagon Alley™, half of The Wizarding World of Harry Potter™ at Universal Orlando Resort. Inside the world-famous wizarding retail district, you can join the Boy Who Lived at Harry Potter and the Escape From Gringotts™, quaff some Butterbeer™ and even buy the perfect wand at Ollivanders™ before catching the Hogwarts™ Express to explore the rest of The Wizarding World of Harry Potter™ — Hogsmeade™ at Universal’s Islands of Adventure™. If you prefer animated fun, you’ll find lots to love at Universal Studios Florida, including Springfield — home of The Simpsons! Grab a Lard Lad donut and a glass of Duff Beer or Buzz Cola before tackling The Simpsons Ride™ and Kang & Kodos’ Twirl ‘n’ Hurl. Then, get drawn into more hilarious hijinks at Shrek 4-D, Despicable Me Minion Mayhem and Woody Woodpecker’s Nuthouse Coaster. And the fun at Universal Studios Florida doesn’t end there! Team up with the reigning king of late night at Race Through New York Starring Jimmy Fallon, or rock out at speeds up to 65 mph on Hollywood Rip Ride Rockit. 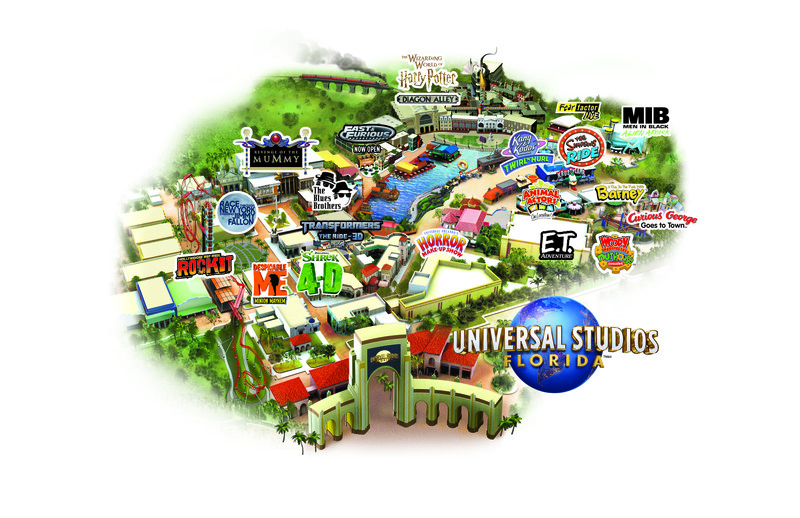 Throw in character encounters, live entertainment, themed shopping and dining, and other fun surprises, and it’s no wonder why Universal Studios Florida is one of Orlando’s most popular theme parks — and one you’ll want to experience for yourself. Secure your discounted tickets from Visit Orlando today! HARRY POTTER characters, names and related indicia are © & ™ Warner Bros. Entertainment Inc. Harry Potter Publishing Rights © JKR. (s18) © 2018 Hasbro. All Rights Reserved. Licensed by Hasbro. THE SIMPSONS RIDE TM Fox. The Simpsons TM & © 2018 Fox. TM & © 2018 NBCUniversal Media, LLC. All rights reserved. Shrek 4-D © 2018 DreamWorks Animation LLC. All Rights Reserved. Universal elements and all related indicia TM & © 2018 Universal Studios. All rights reserved.